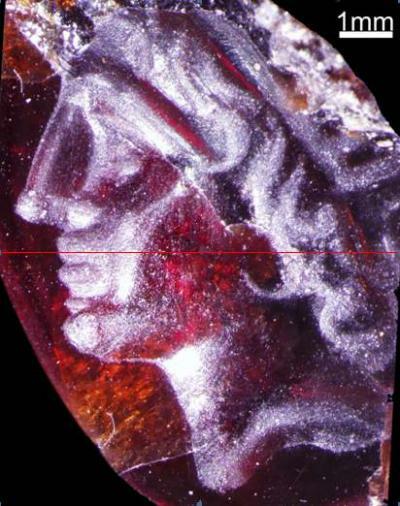 An engraved gem – probably originally mounted on a signet ring – was found by a student-volunteer of the University of Washington in Seattle excavating a Hellenistic public building at Tel Dor, Israel. The motif was identified as a bust of Alexander by Dr. Jessica Nitschke, professor of classical archaeology at Georgetown University in Washington DC. This identification was confirmed by Prof. A. Stewart, author of “Faces of Power - Alexander's Image and Hellenistic Politics” (University of California Press, 1994). Despite its tiny size – not half an inch in length and half that in width – the artist managed to convey the youthful features of the ideal king – straight nose, strong chin, and long curly hair held back by a diadem. Alexander the Great was probably the first Greek ruler who commissioned artists to depict himself. These portraits – which subtly combine realistic and ideal features of the emperor with both royal and divine attributes – were distributed in the form of coins, signets, and other media. They were part of the massive propaganda efforts meant to gain the acceptance of Alexander as the ruler of the world by the subdued populations. Alexander’s portrait remained a popular motif for generations after his death, however, both as an independent theme and as an object of emulation. Later Hellenistic rulers depicted themselves with Alexander-like attributes. By now, the Alexander-theme became identified with youth, bravery and divine kingship. An idealized portrait of the ruler in the likeness of Alexander would bestow these qualities on his successors, it was thought. According to Dr. Nitschke, this particular gemstone is remarkable in two respects. First, it was found in context in a controlled excavation. Most of the Alexander gemstones in museums around the world are unprovenanced. They were either already in collections before the advent of modern archaeology, or obtained through illicit antiquities trade. Some, indeed, may be forgeries. Second, it is surprising that a masterpiece of this quality was found in Israel, which is relatively in the periphery of the Hellenistic world. Master engravers, capable of the artistic excellence obviously displayed in this piece are generally thought to have been employed in the major Hellenistic courts – either in Greece itself or other primary centers, such as Alexandria in Egypt or Seleucia in Syria. Apparently, however, local elites in secondary centers such as Dor could also afford – and were able to appreciate – first class objects of small art. The town of Dor was a major Mediterranean port from c. 2000 BCE to c. 250 CE. Alexander the Great passed through Dor in 332 BCE, on his way from Tyre to Egypt. The Phoenician city apparently submitted without a fight. Thereafter, it became one of the main centers of Hellenization in the Levant – until vanquished by Alexander Janneus, Hasmonean king of Judah, c. 100 BCE. Tel Dor – located on the seacoast at Hof Dor, between Tel Aviv and Haifa – has been the focus of intense archaeological activity for the last quarter century. The project is directed by Dr. Ayelet Gilboa of Haifa University and Prof. Ilan Sharon of the Hebrew University of Jerusalem. Dr. Sarah Stroup of the University of Washington directed operations in area D4, where the gem was found. Over 100 academics, students and volunteers, mainly from Israel and the USA, participated in the 2009 season, just ended. It was supported by the aforementioned universities, the Israel Exploration Society, the Berman foundation for Biblical Archaeology, the Zinman institute of Archaeology, and the Goldhirsh foundation. The gemstone is on display at the Dor museum in Kibbutz Nahsholim.